This Greek Revival/Queen Anne style building has two stories, an asphalt shingle roof and is intact. It is a wood frame, with cross-gable roof with arched bracing, a king post with pinnacle and pendant in side gable. There is a brick center chimney and it has wood clapboard siding. There are scroll sawn brackets & braces on the full front porch. It has 2-over-2 Roman-arched attic window and 6-over-6 windows with authentic window blind. There is a 1-story box oriel on left side, a 1.5-story rear ell on the left side and it has a stone foundation. The arched roof bracing is not a sufficient indicator of the Stick Style as it was far more common in Queen Anne-style houses. Thus the architectural style is Greek Revival/Queen Anne. The original section of this building is a temple-front Greek Revival house with corner pilasters, plain board frieze and architrave forming a triangular pediment in the front gable. 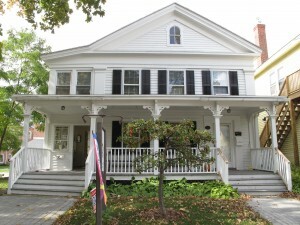 After the building was moved to its present site, it was enlarged by the addition of a cross-gable wing which has the decorative trusses associated with the Stick Style, a style not commonly found in Lenox. The building was later further enlarged by the addition of porches in the ell formed by this wing. These porches have since been enclosed. Originally built on the present site of Trinity Church at the junction of Walker and Kemble Streets by William Perrin Walker. The house was purchased by Josiah Lyman in 1848. Lyman, a principal of Lenox Academy lived in this house for many years. His son, the Rev. Dr. A.J. Lyman, inherited the property but resided in Brooklyn and rented out the house. In 1886 the original property location was purchased by the Episcopalians as the site for the new Trinity Church and for a short time after the churches completion, this house served as a rectory. In 1889 the home was given to the Methodists who moved it to its present Church Street location. It served as the Methodist Parsonage until the Methodist Church building next door was sold in 1926. The house was subsequently converted to use as apartments and shops.